Anane cut short for suspected $90,000 indiscretion “Even that regrettable relationship had its advantages for this country” HONOURABLE DR. RICHARD ANANE, The nominee for Roads and Transport yesterday went through various stages of emotions during his marathon vetting before the highly improved benchmarks and finally faltered on what he preferred to view as his private life'. 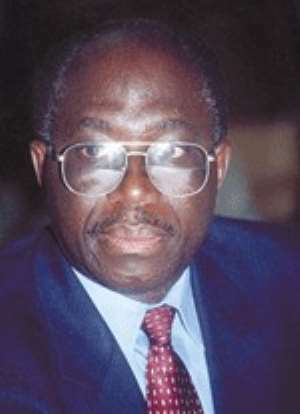 From poker face to a forced smile to almost admirable candour alien to the Ghanaian public office holders, Dr. Richard admitted to having a sexual relationship while he was a Minister of State with an American lady he said was his other wife – but who has given him a bouncing baby boy. It was Honourable Freddie Blay the Chairman of the Appointments Committee who surprisingly abandoned his previous patronizing posturing with the nominees, and set in motion questions that were to lead to Richard amazing 'mea culpa' on national television, (courtesy of TV 3). Informing his interviewers that he had come with his 'supportive' wife, the nominee first told the panel that reports in the newspapers (The Chronicle) and certain allegations he usually treated as 'unmeritorious' and not deserving of responses. But when his fellow MPs alerted him that he is a public office holder and not a doctor at his private practice in Kumasi, his countenance dropped. From then it was roller coaster ride to the point where the ranking member for Nadowli North who has won almost universal acclaim to discerning Ghanaians about the importance of the exercise to international public perception, told him that the allegations against him were so serious that they needed to be investigated. This was a clear signal that his appointment may be put on hold. Fighting to redeem himself from that prospect with his legitimate Ghanaian wife sitting in agony close by, Anane took a deep breath and tried to redeem himself with a loaded statement, to wit, he bonked the American woman for mother Ghana – a patriotic stroke for which he should not be hanged, because it inured to the benefit of Ghana. “That relationship”, a rehash of American President Bill Clinton's 'that woman' statement “ regrettable as it may be, had its advantages for this country”. But it was too late, Honourable member for Ellembele who had slipped in a word edgewise for his region, waved him off before he could explain how his 'bonking' may bring benefits to Ghana's Gross Domestic Product. Anane, whose presentation was punctuated with some contradictions, had a few petitions against him involving several allegations pertaining to contracts and conflict of interest. At one point he said he usually returned part of his per diem, but at the same time he said his relatives, supplemented his per diem when he travelled on overseas trips. It was so incredulous that Alban Bagbin, the star of the vetting, pointedly told him that he did not believe him. In his presentation-in-chief Anane confessed that the story and picture published by The Chronicle as to him having a son with a woman called Alexandria is correct. He said he met the woman in Washington on February 2001 at a conference. Dr. Anane said it was at this conference that the woman first took notice of him and that she was interested in carrying out an HIV/AIDS programme in Ghana. He said he was also interested in capacity-building in the health industry and the National Health Insurance Scheme. The MP noted that he terminated the lady's business in Ghana because the health geography of the country she wished to undertake, was too sophisticated and not possible in Ghana. He admitted having an affair with the woman. Questioned about the numerous transfers he did for the woman in the USA for her upkeep, the minister designate denied ever transferring $45,000 twice a year or $90,000 to the lady although he confessed giving her an amount of about $6,000 to $10,000. Quizzed by the minority leader about the sources of such huge payments since he was not practicing his profession when he became a minister, he replied “I get money from my brothers, friends, among others. Anytime I travel, they give me money”. He said he footed the hotel bills of about ¢51million at Esthers Hotel for Alexandria when she was in Ghana but not the bills from La Palm Beach Hotel. He said he gave her $10,000 He told the appointments committee of parliament that days after a newspaper publication about he and his baby Nicholas, the lady called her crying and citing that she did not know anything about the story and that she had no hand in the publication. He said the lady told him that the documents the newspaper published were given out over a year ago. Asked whether he was aware of any court case against him in the United States, he said he was just hearing about it, implying that there may be no such action. He thought it was not his fault that the lady had lost her job and accommodation among others through his relationship with her but noted that his responsibility was to take care of his son. Bagbin, who was not satisfied with the answers Dr. Anane had given called for investigations into the issue as evidence he had contradicted what the minister designate had said. Dr. anane said he swore to speak the truth and he did that. GHANA AIRWAYS DEBT The minister designate said the debt of Ghana Airways has further soared from $130 million since the government took over to $162 million currently, although the deficit of the airline has declined considerably from ¢100.9billion in 1999 to ¢16.8 billion in 2002. He noted that the forensic audit that was conducted into the activities of the airline by the Price Waterhouse Coopers had indicated that Ghana Airways was losing one million dollars ($1m) a month, thus $12 million a year. He revealed that the audit is currently with the Attorney General, and investigations by the Serious Fraud Office (SFO) are yet to be concluded. “SFO has not concluded its own investigation and would make it known when it is finished”, he noted. He told the appointment committee that Ghana holds 30% of the new airline Ghana International Airline (GIS) and that under no circumstances would government's stake go below 25%. On the severance awards to staff of Ghana Airways who would be laid off with the incoming of GIS, the acting minister said, a committee has been set up to negotiate with the workers. He however noted that government has not found the money to pay off workers affected by the change in ownership of the airline. Dr. Anane denied having links with Western Link, CYAM and Art Work although he knew their Managing Director except Art Work. He debunked the assertion that Ms. Poku who is the MD of Western Link is his girl friend and he had awarded a ¢40 billion contract to her. “The only time I get involved in contract awarding is when I think the country is going to be shortchanged as was in the Mallam Kasoa road”. The minister designate also denied that $300,000 was stolen from his ministry. He would not comment much on the case pending in court where he has been dragged to, for non-payment of rent for his Hospital. He said the landlady want four times the rent he pays. Dr. Anane said the mass transport programme has still not eased the traffic congestion in Accra, revealing that 50 more buses have been introduced into the transport system. “A scheduled transport system would be introduced very soon”. He told the committee that Rural-District Transportation System would also start in earnest.